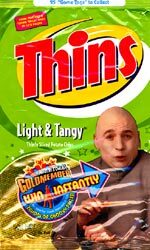 Taste test: Thins Light and Tangy have changed considerably since they were first introduced. Basically, they are a thin chip, flavored with a variety of herbs and spices. However, when they first hit the market, the flavor combination was perfect. They were just tangy enough and spicy enough to stand out as a regular snacking choice. Then they changed the recipe. This was a bad, bad move. No longer were they something to be relished — instead, they became the weakest of the Thins flavors. I assume there were complaints, because they appear to have changed the recipe again — sadly, not quite back to how it was — which has made them enjoyable again. But they have not reached their former glory, and I wonder if they ever can again. Eating a pack is still a little disappointing. Smell test: A light, herby aroma.